They are one of the most feared spiders in North America. And now the brown recluse – or Loxosceles reclusa – spider population is growing, and predicted to expand into the northern states as a result of climate change. Currently the spider, the bite of which in rare cases can kill a child under seven and those with a weakened immune system, is mostly found in the Midwest and southern U.S. There are a few ways to identify a brown recluse spider. Firstly it has a dark violin-type marking with the neck of the violin pointing towards its abdomen. Secondly, most spiders have eight eyes, but the brown recluse only has six, arranged in pairs. An adult recluse spider is 1/4 to 3/4 inches long. They are typically found in the Midwest and southern states and tend to build their webs in woodpiles and sheds, cupboards and other places that are dry and generally undisturbed. If they get inside the house they often favour cardboard but have also been found in shoes, bed sheets of infrequently used beds, in clothes stacked or left lying on the floor, inside work gloves, behind baseboards and pictures, and near sources of warmth. Bites are rarely fatal, but children, the elderly and those with a weakened immune system should be careful. Some are unaffected by a bite, whereas others experience immediate or delayed effects as the venom kills the skin tissue. People may experience restlessness, itching, fever, chills, nausea, vomiting, or shock. A small white blister typically appears at the bite site surrounded by a swollen area. This can expand to a grisly open wound ranging from the size of an adult’s thumbnail to the span of a hand. There is no effective anti-venom. Some doctors will treat the wound with high doses of cortisone-type hormones or with oral Dapsone (an antibiotic used mainly for leprosy). But researchers are predicting the population will expand to parts of Nebraska, Minnesota, Wisconsin, Michigan, South Dakota, Ohio and Pennsylvania by 2080. The spiders tend to build their webs in woodpiles and sheds, cupboards and other places that are dry and generally undisturbed. 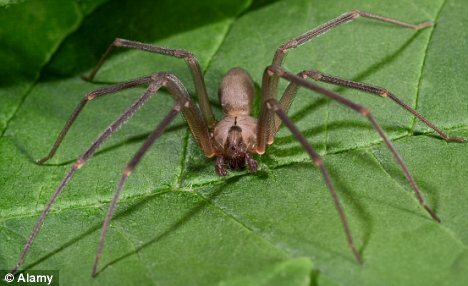 When provoked (or squished up against the skin by accident) the brown recluse injects a powerful venom that in rare cases can kill. In some cases the bite can kill the skin tissues at its site, leading to painful sores and deep scarring. Doctors often misdiagnose a brown recluse bite and can confuse it with other serious conditions, including Lyme disease and various cancers. It was felt it would be beneficial therefore to track the spider in order to predict where it might be found in the future so medical professionals – and the public – can prepare. Study author Erin Saupe, a graduate student in Geology and a Biodiversity Institute student and other researchers used a predictive mapping technique to build a picture of where the spider may be found in the U.S. going forward. They then applied future climate change scenarios to the spider’s current location in the Midwest and southern U.S.
‘These results illustrate a potential negative consequence of climate change on humans and will aid medical professionals in proper bite identification and treatment, potentially reducing bite misdiagnoses,’ study author Erin Saupe, a graduate student in Geology and a Biodiversity Institute student, told science journal PLoS ONE. Previous The Old Style Republican still exists in the US!